I have absolutely no childhood memories of hot biscuits or a kitchen dusted with White Lily flour. (I remember tubes of crescent rolls, which are culturally-relevant memories in their own right.) Biscuits do not comfort me with thoughts of home, but rather fall alongside other foods I’ve adopted as my own in the mishmash palate of things I have made and shared. These things, in particular, I made in college with my boyfriend who lived two hours away. We baked biscuits or orange sweet rolls on Saturday nights and watched the entire James Bond series over the course of a year in that tiny studio, pausing the scenes while we took baking pans out of the oven or dried dishes. This is how you assign meaning to food you did not grow up with: something is good and you share it. There’s the context you were missing. Before this cheddar version, I had only tried making one biscuit recipe: a cracked-pepper green onion interpretation that tasted like baked potatoes. The combination of butter, salt, and cheddar tugs at my heart a lot more. These biscuits are very forgiving and taste excellent alongside soup. They freeze so well that you can almost replicate the fresh-baked experience by grabbing two or four out of the freezer and microwaving them for a few seconds (a desperate snack). Eat them fast if you do this, though. There’s no time to lose, there’s no one home to see you do it! Heat oven to 425. Combine flour, salt, and baking powder in a mixing bowl. 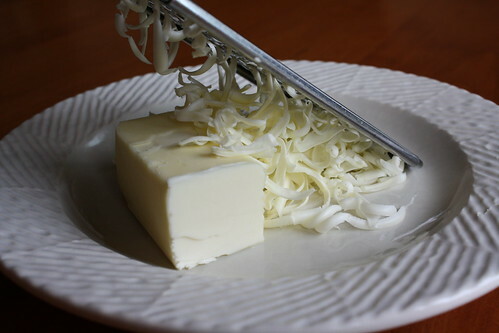 Add the butter (and quickly, because it’s going to melt), which I do by grating the sticks with a cheese grater into the mixing bowl while the mixer is running on low. Combine the buttermilk and egg in a small bowl and beat together. Add this mixture to the flour/butter combo and mix until moistened. Toss the shredded cheddar in a pinch of flour and add the cheese to the dough (mixer or arms on low). Mix until barely combined–you do not want to overwork your dough or the biscuits will be hard. Flour a counter or a big wooden cutting board, dump the dough out of the bowl, and knead the dough a few times (I think 3 turns is enough). Roll out the dough so it is about ½ to ¾ inch thick. 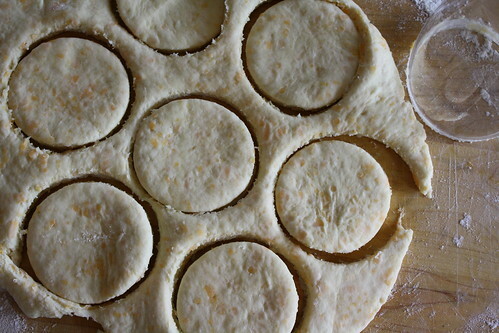 Dip your round cutter into flour and cut out biscuits. 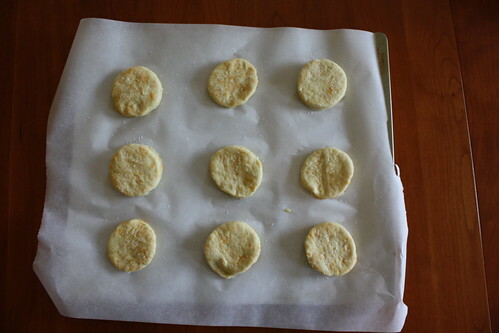 Move the cut biscuits to a baking sheet lined with parchment paper. 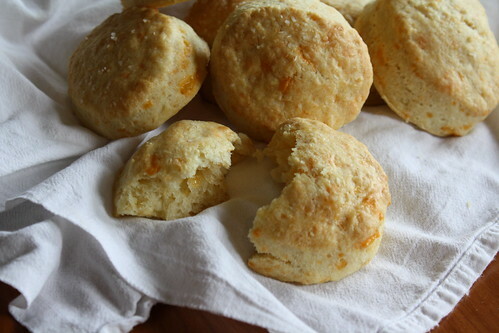 You can also turn the leftover scraps of dough into biscuits, though they won’t be as uniform as the first batch. Brush egg wash lightly over biscuits and top with a small sprinkle of salt. A silicone brush is a perfect tool for this, but a folded-up paper towel also works. Bake for 20-25 minutes, until starting to brown. Eat while warm. For weeks after, they reminded me of Pizza Hut when I sat down at the table. In mock surprise, И. would look at me when I entered the kitchen and say, “You’re here! There are no restaurant parties for you tonight?” З. was a kinder woman and did not endeavor to make me feel bad, but seemed to interpret my one night off from her cooking as a judgment on all her food. She was sorry there was no pizza, and I was sorry I had ever made that call. I told them I was going to miss dinner the night I left for Moscow, and after attempting to convince me to take a later train, И. conceded: “At least it’s not for a restaurant!” И. and З. sent me to Moscow with a plastic bag filled with my missed dinner: an egg sandwich, three hard boiled eggs, four pieces of bread, six apples, three oranges, five cookies, nine grapes (И. chased me down the stairs as I was leaving with a bowl of grapes and instructed me to take some “in case I got hungry”), a bag of crackers, an entire package of butter tea biscuits, four lemon hard candies, and two giant bars of expired chocolate. On the train, I opened those butter tea biscuits, and they must have been in that tiny kitchen soaking up the air for years because they tasted just like it. Cooked onions, dusty, and stale. That pizza had tasted like nothing familiar, and with a bite of an old biscuit, I found that I really did miss dinner. Note: The original recipe in Alice’s Cookbook is called “The Easiest Frozen Yogurt with a Blackberry Swirl.” She warns that if you over-mix the berries into the yogurt base, you will have a “purplish yogurt instead of a swirl.” This sounded awesome to me, so I embraced the full union of berries and yogurt and also added raspberries. 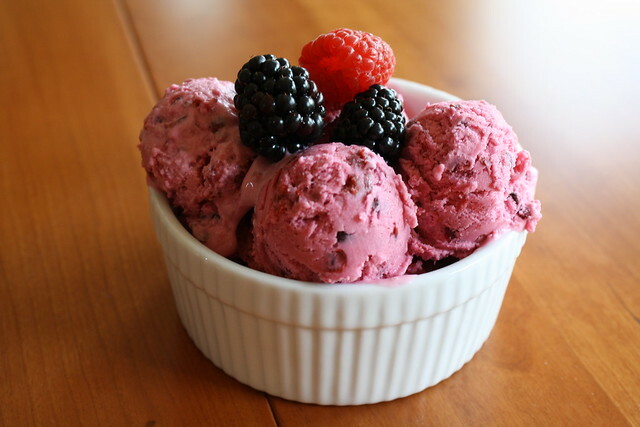 I would recommend making the berry syrup at least two hours before the yogurt, lest you find yourself with yogurt in the ice cream maker and still-hot syrup (I thought I would…test…this possibility for you. Nothing bad happens! It just, obviously, melts the frozen yogurt and the whole thing will take longer to freeze). Slice the vanilla bean down the center and scrape out seeds, reserving for the yogurt base. 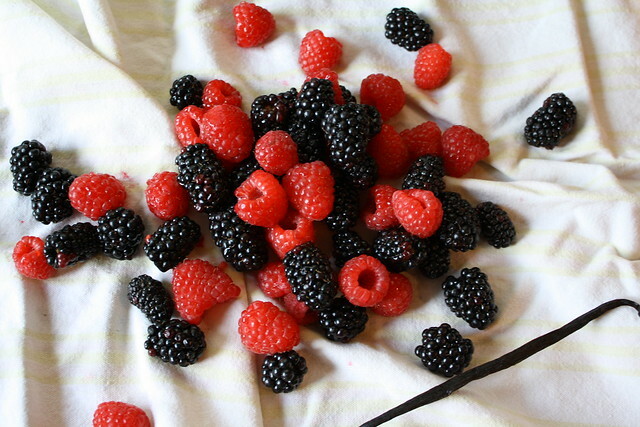 Measure berries and sugar into a heavy saucepan, add vanilla bean, and heat over medium until the berries start to fall apart. Use the back of a wooden spoon to smash the berries against the pan sides; you want the berries to be almost fully broken down. 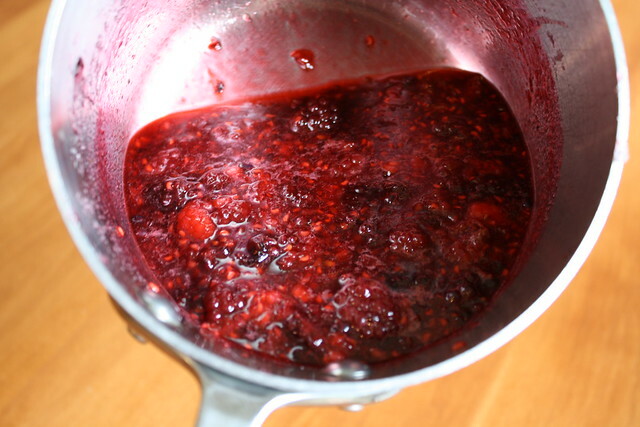 When the berries form a thick syrup (after about 10 minutes), you’re done. Put the berry syrup in the refrigerator to cool it down and watch a few old episodes of the X-Files. 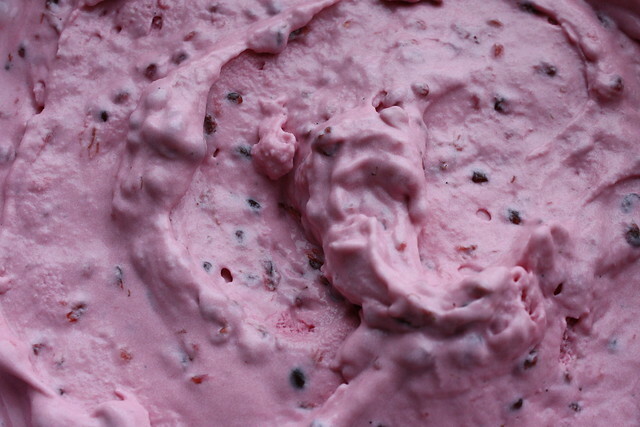 Beat together the yogurt, sugar, and vanilla seeds until combined. That’s it! Do you have an ice cream maker? If not, you can try to make one by putting a gallon bag of yogurt base inside a larger plastic bag filled with ice and rock salt. My instructions will assume the former. Pour yogurt base into ice cream maker and turn on. Go check on your berry syrup; if the syrup is completely cooled, take out the vanilla bean. If you do not want seeds in your yogurt, you can strain the syrup through some cheesecloth. Once the yogurt base has thickened and partially frozen (about 15 minutes), pour in the berry syrup “to taste” (I had a fourth cup left before I decided “That’s enough of that!” and saved the rest*). Continue churning until the yogurt has reached the consistency of soft serve. There is a point when it just won’t get any colder in an ice cream machine, so scoop yourself a preview cup of the soft yogurt and put the rest in a large container in the freezer to firm for a few hours (or overnight). It gets very firm in the freezer, so let the frozen yogurt sit at room temperature for a few minutes before you scoop and serve. *Do you have extra berry syrup? Put it on waffles or pancakes; swirl it into non-frozen yogurt; put it on top of the frozen yogurt you just made; drizzle it over pound cake; freeze it into ice cubes and put them into summer cocktails; mix it into balsamic vinegar and olive oil to make a great fruity dressing; eat it by the spoonful. All of those are endorsed options.